These are beautiful skins that are soft and supple. The summer skins are a reddish brown speckled with white. 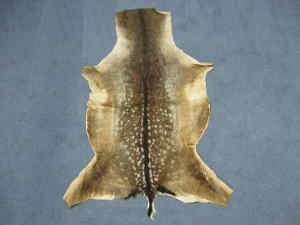 The summer fallow deer skins are very similar to Axis deer from the Indian subcontinent. The skins in winter are a gray-brown with longer, softer, hair and guard hair. The hair length is approximately 0.5" long for the summer deer, 2" long for the winter deer, and 1.5” long for the fawn. One random adult deer weighed 7 lbs. (3.17 kg). Supplies of the winter skins are generally available. The summer skins are very rare - we only received 11 in 2007, 11 in 2008, and 22 in 2009. Our Gxx codes denote individual pieces. 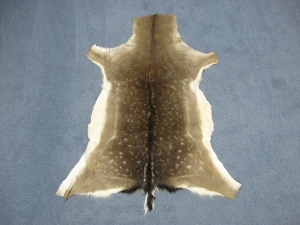 If you would like to order a specific fallow deer hide, please go to our Galleries to pick the exact one shown. Genus and species: Dama dama. Wild. Fallow deer are not endangered and are not subject to CITES. The animals are not killed just for their skins. These deer were hunted for meat. The skin is saved and tanned.